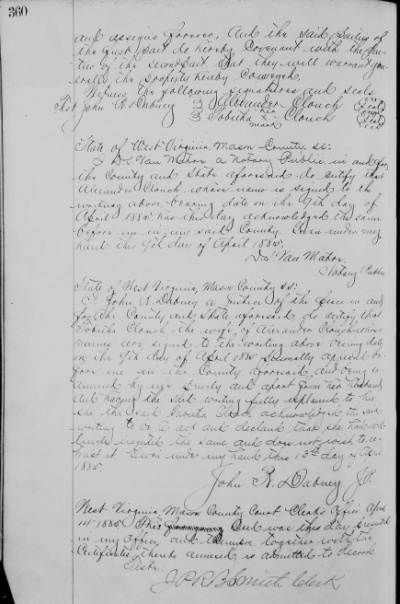 After finding the land records I transcribed in my previous posts: The Estate of William Clonch (1807-1863) of Mason County, West Virginia and The Estate of William Clonch (1807-1863) of Mason County, West Virginia – Part 2 I wanted to know when William CLONCH (1807-1863) bought the 148 acres tract and who the grantor had been. 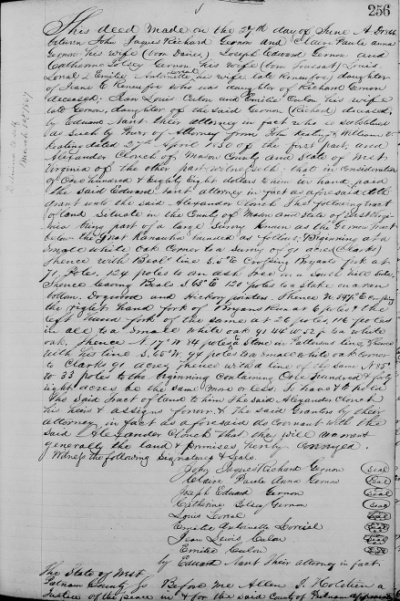 In the land deed index for grantor and grantee, I could not find an entry for my 3rd great-grandfather William CLONCH even with different spellings of the name, i.e. CLAUNCH, CLOUNCH. Neither his father Dennis CLAUNCH nor his mother Nancy BEASLEY owned land per the deed books. Neither left a will conveying land to William and/or to of his siblings: Elizabeth, John, and Sarah. ► If he didn’t own land, how could he will his land to Mary DOSS and her DOSS children? 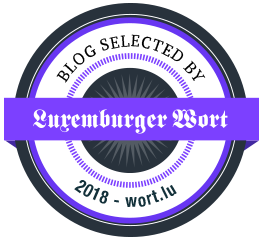 ► How could his heirs later convey land as a group to three of the DOSS siblings, also known as CLONCH, in 1892 allowing it to remain in the family? William CLONCH lived with Mary DOSS from sometime before 1840 until his death in 1863. They were not married. Eight children were born between 1840 and 1855 during the years William and Mary were together. William left a last will and testament naming Mary DOSS and her seven living children as his heirs. These children later went by the CLONCH surname. DNA results show descendants of these children carry Clonch/Claunch and Doss DNA. The 148 acres sold in 1885 had similar call lines as the three tracts of land which were sold in April 1892 by the heirs of William CLONCH.4 I had been able to plot two of the tracts but the third had a problem call and I could not plot it. I thought by plotting the three tracts I would be able to put the pieces together to form the original 148 acres. Was it only a coincidence William’s and Alex’s lands contained the same amount of acreage? Reading and transcribing the land deeds of Alexander CLONCH brought to light some thought-provoking information. The grantor of the land sold in 1866 was a group of persons, children and their spouses of the deceased Richard GERNON, who were being represented by their attorney’s representatives through a power of attorney. This deed made on the 27th day of June A.D. 1866 between John Jaques Richard Gernon and Claire Paule Anna Gernon his wife (born Davies) Joseph Edward Gernon and Catherine Tolsey Gernon his wife (born Toussat) Louis Loreal & Emilie Antoinette Loreal his wife late Reneufoe daughter of Jeane E. Reneufoe who was daughter of Richard Gernon deceased; Jean Louis Culon and Emilie Culon his wife late Gernon, daughter of the said Gernon (Richard) deceased by Edward Naret their attorney in fact who is substituted as such by Power of Attorney from John Keating & William V. Keating dated 27th April 1850 of the first part and Alexander Clonch of Mason County and State of West Virginia of the other part witnesseth: that in consideration of One hundred & eighty Eight dollars to him in hand paid the said Edward Naret attorney in fact as aforesaid doth grant unto the said Alexander Clonch The following tract of land Situate in the County of Mason and State of West Virginia being part of a large Survey Known as the Gernon Tract below the Great Kanawha bounded as follows: Beginning at a Small white oak corder to a Survey of 91 acres (Clarks) Thence with Beal’s line S 5° E crossing Bryants fork at 71 poles, 124 poles to an ash Tree on a South hill side. Thence leaving Beals S 63° E 120 poles to a Stake on a run bottom Dogwood and Hickory pointers. Thence N 34 1/2° E crossing the right hand fork of Bryans Run at 6 poles & the left hand fork of the same at 26 poles, 116 poles in all to a small white oak N 44° W 52 P to a white oak. Thence N 17° W 84 poles to a stone in Patterson’s line, Thence with his line S 65° W 94 poles to a small white oak corner to Clarks 91 acres. Thence with a line of the same N 85° W 33 poles to the beginning containing One hundred & forty eight acres be the same more or less. To have & to hold The Said Tract of land to him The said Alexander Clonch his heirs & assigns forever & The said Grantors by their attorney in fact as aforesaid do covenant with the said Alexander Clonch that they will warrant generally the land & premises hereby conveyed. the within named John Jaques Richard Gernon and Clair Paule Ann Gernon his wife Joseph Edward Gernon and Catherine Tolsey Gernon his wife, Amelie Antoinett Loreal & Louis Loreal her husband, Emilie Culon & Jean Louis Culon her husband by Edward Naret their within named Attorney in fact & acknowledged the signing and Sealing of the within conveyance to be their voluntary act & Deed. In witness Whereof I have signed my name and affixed my seal this 27th day of June A. D. 1866. West Virginia Mason County Recorders Office December 3rd 1866 The annexed Deed with U.S. Internal Revenue Stamp thereon for fifty cents was this day exhibited in said office and together with the Certificate thereon admitted to Record. As seen in the above deed, the land was part of a larger survey known as the Gernon Tract. I checked the index again to see if others had been granted land from this tract. The first mention of the Gernon Tract was found in a deed dated 1821. The deed is a history lesson in itself. It mentions acts of Congress which allowed direct taxes to be collected from landowners. On 9 January 1815 Congress passed “an act to provide additional revenues for defraying the expenses of government and maintaining the public credit, by laying a direct tax upon the United States, and to provide for assessing and collecting the same.”5 On 5 March 1816, this was repealed by Congress reverting back to an act passed in 1813.6 Both of these acts are mentioned in the 1821 deed. In 1823 MERTENS sold the land back to the owner who had been delinquent on his tax payments, Richard GERNON, formerly a U.S. citizen living in Philadelphia, now residing in Paris, France. Was GERNON’s non-residence in America the reason he did not pay his taxes? As later deeds were consulted, I learned the tract was being reduced by surveys as pieces were sold, apparently, to the persons who had been living on and working the land. The original tract situated (per 1834 deed) in Mason County originally containing twenty one thousand five hundred Acres, Patented to Richard Smyth assignee of Henry Banks the Sixth day of December one thousand Seven hundred and Ninety four & conveyed by the said Patentee to the above named Richard Gernon, by deed dated 29 August 1795 Recorded in the clerks office of the General Court of Virginia at Richmond 16 Novr. 1795. 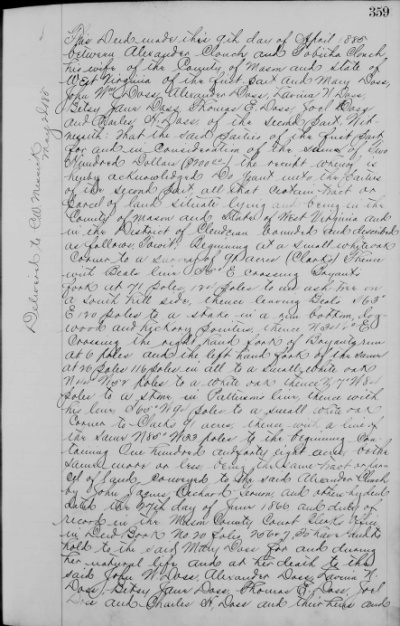 The land deeds for the Gernon Tract are a genealogical find for those interested in the family of Richard GERNON and his wife Antoinette GAUSE whose name was mentioned in the 1834 deed.8 I was intrigued when I found his wife’s maiden name was GAUSE as, after separating from William CLONCH, his ex-wife Ann Eliza HILL married a man named Andrew J. GAUSE, later seen as GAUZE. It was one of her GAUZE descendants’ fault I’ve been writing about the land deeds since my post, I No Longer Need that Lookup, Folks! It would appear that William CLONCH was living on land which had been surveyed for him as late as 1856. At the time of his death, he was likely expecting to buy the land but the deeds had not been drawn up and recorded. In 1885 Alexander Clonch and his wife Tobitha deeded land to his mother Mary DOSS and ALL of her DOSS children, including himself. 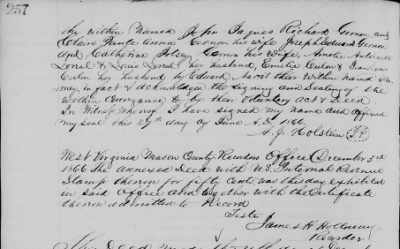 There is no mention in the following deed that Alexander CLONCH is the same person as Alexander DOSS but the deeds discussed in the previous posts show the sons of William CLONCH went by CLONCH and DOSS. and assigns forever, and the said parties of the first part do hereby covenant with the parties of the second part, that they will warrant generally the property hereby conveyed. Witness the following signatures and seals. I D. S. Van Matre a Notary Public in and for the County and State aforesaid do certify that Alexander Clonch whose name is signed to the writing above bearing date of the 9th day of April 1885 had this day acknowledged the same before me in my said County. Given under my hand this 9th day of April 1885. I John R. Dabucy a Justice of the Peace in and for the County and State aforesaid, do certify that Tobitha Clonch the wife of Alexander Clonch whose names are signed to the writing above bearing date on the 9th day of April 1885 personally appeared before me in the County aforesaid and being examined by me privily and apart from her husband and having the said writing fully explained to her she the said Tabitha Clonch acknowledged the said writing to be her act and declared that she had willingly executed the same and does not wish to retract it. Given under my hand this 13th day of April 1885. West Virginia, Mason County Court Clerk’s Office April 14th 1885. This Deed was this day presented in my office and thereupon, together with the certificates thereto annexed, is admitted to Record. I think it’s possible my 3rd great-grandfather William CLONCH was living on the land for several decades before he died in 1863 and he intended to pass it on to his DOSS children and their mother Mary E. “Polly” DOSS. In 1860 when the census was enumerated his Value of Estate Owned was $444 for Value of Real Estate and $120 for Value of Personal Estate. Why would he have real estate valued when he did not legally own it? I am not aware of the practices of the time. Did William CLONCH have the land he was living on and working surveyed? And did he consider it his land after the survey? I checked the index to surveys and his name was not listed. While searching the deeds index I found my great-great-grandfather Alexander CLONCH (1842-1910) obtained land in 1866 and sold the same in 1885. It was interesting to find Alex owned land in Mason County, West Virginia, from 1866 until 1885. The sale of the land fit into the time period when he was known to be moving to Fayette County as well as applying for his Civil War pension. From the above, would you also say the land Alexander CLONCH bought in 1866 and sold to his mother and siblings in 1885 was the same piece of land William CLONCH lived on during his later years and willed to Mary DOSS and her children? Or do I have to do more work and plot all of the lots from the Gernon tract and fit the pieces of the land puzzle together to prove the three lots sold by the heirs in 1892 were the land Alexander bought in 1866 and sold in 1885? © 2019, copyright Cathy Meder-Dempsey. All rights reserved.